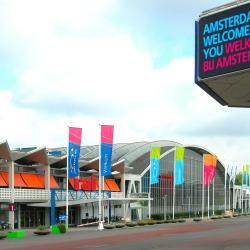 Looking for hotels near Anne Frank House? Offering free WiFi and river views, Former Rembrandt workshop two bedroom apartment is a property located in Amsterdam. Located near the famous 9 Straatjes shopping district, Hotel IX Nine Streets Amsterdam is located in Amsterdam. Free WiFi access is available here. This hotel features boutique-style rooms with free Wi-Fi and iPod docking station. It is in the scenic and peaceful Grachtengordel-West district. Petit Prince offers a luxurious Bed & Breakfast in the Nine Streets shopping area with free Wi-Fi and unique Prinsengracht Canal views. They feature free food, drinks including wine, and flowers. 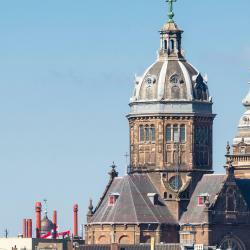 Featuring a shared lounge, Rio's Bed and Breakfast Amsterdam is a bed and breakfast is set in Amsterdam, a 3-minute walk from Royal Palace Amsterdam. This bed and breakfast offers a shared kitchen. Mr. Jordaan provides accommodations in Amsterdam near Anne Frank House and Royal Palace Amsterdam. The property is located 1.2 miles from Flower Market, 1.4 miles from Basilica of St. What a wonderful place! Looks like they thought of every single thing, and the design is beautiful! 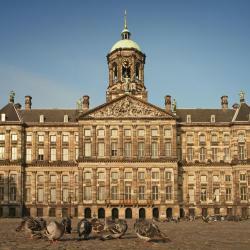 The Hotel Clemens has rooms right in the center of Amsterdam, a 4-minute walk from the Royal Palace. 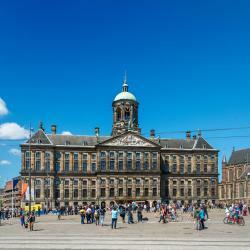 The famous shopping area Dam Square is just over a quarter mile away. The staff was very friendly, they offered to carry my luggage up and down the stairs. Located near the famous 9 Straatjes shopping district, Hotel IX Nine Streets Amsterdam is located in Amsterdam. Free WiFi access is available here. Susan and Merel were great. Helped with everything and were available all the time. This townhouse from 1680 looks out over the Keizersgracht canal in Amsterdam, in the center of the Nine Streets shopping area. Rooms and apartments are offered at this accommodations. Everything was great, from check in to check out. The staff were very helpful and SO friendly. This 3-star hotel is on the Herengracht Canal in central Amsterdam. The renovated 17th-century building offer free Wi-Fi, with Central Station and the Anne Frank house just a 10 minute walk away. Even an employee who wasn’t on the clock helped us and said she would see us the next day. This 17th century merchant house is located along the Herengracht Canal, a 5-minute walk from Dam Square. There is free Wi-Fi and an internet corner. Very traditional and cozy hotel in a fantastic location in Amsterdam. Set in a monumental building, Boutique Hotel La Belle Vue features accommodations in Amsterdam. Great location. Large room. We had a beautiful view of a main Street out of our window. 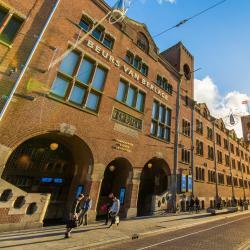 Hotel de Westertoren is located only steps away from Dam Square and a 10-minute walk from Amsterdam Central Station. Each room has coffee and tea facilities and free Wi-Fi. Very clean and fresh towels and daily room cleaning. I had a single room in the top floor. Moving experience. Seeing the diary's handwritten pages provided a true moment of reflection. The Anne Frank House and her words and photographs put a face on the Holocaust. The stairs can be intimidating but worth the effort. Hop on Hop off is not reliable to get you here on time! Hop on Hop off is not reliable to get you here on time! Anne Frank expects you to be on-time, as they have so many people booking. Use tram or taxi. Loved the hop on hop off for leisure canal trips. Great people. Try to book a reservation as soon as you know you are going. Try to book a reservation as soon as you know you are going. %90 of the tickets are sold out 2 months in advance. But %10 are released each day. We were extremely lucky to get 2 tickets at 8:30 on Saturday night by booking that noon. It was an amazing and informative experience. It was an amazing and informative experience. To be able to walk in the same spaces that Anne Frank and her family and friends lived in secret for such a long time was special to me. As anyone can see Anne was a vibrant, talented and soulful child. It was an honor to be there. The tour was organized well and this opportunity was one of the highlights of our trip to Amsterdam. Everyone should visit, so we will never forget what happened. Everyone should visit, so we will never forget what happened. It is a very touching story with a very sad ending. Fortunately for the next generations, Anne wrote down all her feelings and what they went through to hide. Thanks to her father we have all these memories. People are talking about Anne Frank House! Explore guest hotel reviews featuring "Anne Frank House"
I like the old world style to the neighborhood. The buildings around were amazing. The hotel it’s self although the entrance was small and steep it was an amazing look into the old world. The rooms were way small but provided everything needed for the stay. The balcony was a good perk. The location was very very central to everything! 5 minute walk to the palace and area surrounding it such as the shopping streets and restaurants. 3 minute walk to Anne frank house. A charming small boutique hotel in a historic house close to the center of the city. A short walk to the Anne Frank House in one direction, or the nightlife and shopping areas in another, but on a quiet side street overlooking a small canal. The rooms have been redone very tastefully, with a lot of attention to completely new bathrooms. The staff were uniformly friendly, helpful and responsive to all our requestions. The hotel was a great location for visiting the Anne Frank house, located outside of the red light district but within walking distance made it ideal. The beds were very comfortable and felt very clean. It was authentic and we really appreciated being able to see the architecture that these old building had. The room was bigger than we expected. And quite nice. It even had a little patio. The staff helped book us to Anne Frank House that same afternoon; thankfully, she did because we heard it was always fully booked, and that was the only time we had. Staff was exceptionally helpful. Location was great, surrounded by good restaurants and shops. Easy walk to Anne Frank house and Centraal Station. The hotel was very nice. The bartender Beatrice was So friendly. They held our bags before check in so we could go to Anne Frank house. 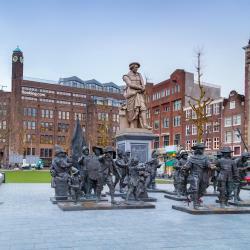 Great place to stay- friendly staff, great area to walk to museums and Anne frank house and lots of restaurants nearby. For the Anne Frank Huis - be prepared for long queues, get a special ticket or book in advance. My friends and I waited in line for over 2 hours - during a heat wave, no less! There are a few things to do while you wait, that is, if someone can hold your place in line. You can go and take a look at the original front of the house, and the view of Prinsengracht is very nice. There are also a couple of souvenir shops that serve cold drinks and snacks, as well as a bathroom, to the left of the queue. Also, the nearby LGBT tourist information booth sells really pretty postcards. Get to places as early as you can. We went to Anne Frank House at 9 and we only had to wait for 45 minutes.